rv.squawk1200.net - Let the RV-8 fun begin! www.pilotian.com - My flight journey! 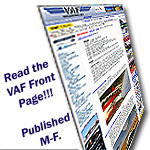 www.rv8plane.com - Open and up to date!